HE DIDN’T DO IT. BUT THEY FRAMED HIM. THEN BETRAYED HIM. NOW THERE WILL BE HELL TO PAY. Dan Roy is an elite Black Ops solider. His life has been a never ending spectrum of action. Now, his soul needs a break. His only confidant dies mysteriously, and soon Dan and those close to him are chased by a force far greater than himself. In a race against time to save the world from destruction, Dan Roy finds himself up against a terrifying terrorist attack. There is no one to help. Dan has to fight back, with his back to the wall. 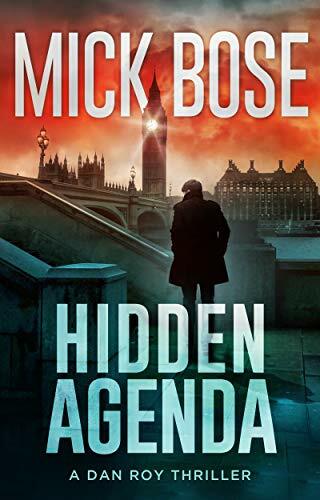 Click here to pick up your free copy of Hidden Agenda in the Amazon Kindle store. Mick Bose is the author of the Dan Roy action thriller series. If you like Reacher, Rapp and Baldacci you will love Mick’s books. Mick lives in London,UK. He has hiked in the Himalayas, farmed in a Kibbutz, floated in the Dead Sea, lived in Russia when Communism fell and was refused entry to a posh restaurant in Washington DC because he wasn’t wearing the right shoes. Well, the food was overpriced. Mick’s books are not, and he writes them because he wants to entertain you. You can visit Mick’s Amazon author page if you click here.